In a rather awful half of basketball, the Portland Trail Blazers took a lead of 47-43 over the Clippers into the break Monday night in Game 3 of their first-round playoff series at Moda Center in Portland. 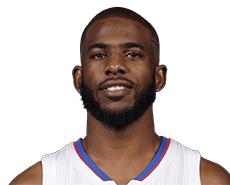 Chris Paul scored the Clippers’ first 12 points. No other player on the team scored until Jeff Green made the second of two free throws with 2:07 left in the first quarter. Paul led the Clippers with 14 points. J.J. Redick missed his first six shots and finished with three points on 1 of 7. Blake Griffin also started slowly and ended up with seven points and five rebounds and Green and Jamal Crawford scored 10 and seven points off the bench, respectively. Al-Farouq Aminu led the Trail Blazers with 13 points, Damian Lillard had nine, Maurice Harkless six, Allen Crabbe six and C.J. McCollum five. The Clippers shot 33.3 percent from the field, Portland shot 35.7 percent. The Trail Blazers also committed 12 turnovers, quite a bit for a half. This entry was posted in Results and tagged Blake Griffin, C.J. McCollum, Chris Paul, Damian Lillard, Jamal Crawford, Jeff Green, Los Angeles Clippers, Portland Trail Blazers by Robert Morales. Bookmark the permalink.